We hear lots of questions from new customers wondering why we ask for Facebook Page permissions. And that's understandable! We ask for permissions when you first sign up, as well as, every time you perform certain tasks, like scheduling a post or viewing metrics. So what's with all the authorization?! Quite simply, we need these permissions because ActionSprout is a Facebook Page app, and without your permissions, our app wouldn’t work. In other words, without approving these permissions, you will not be able to use ActionSprout. And that's a good thing! Facebook is ensuring your page remains secure by making sure that you and your team only let in trusted apps and tools. It's also the way we confirm who you are and what Pages you have permission to manage. Keep in mind that Facebook decides how these permissions are named, and the way they’re named doesn’t always do a great job of explaining why ActionSprout needs them. 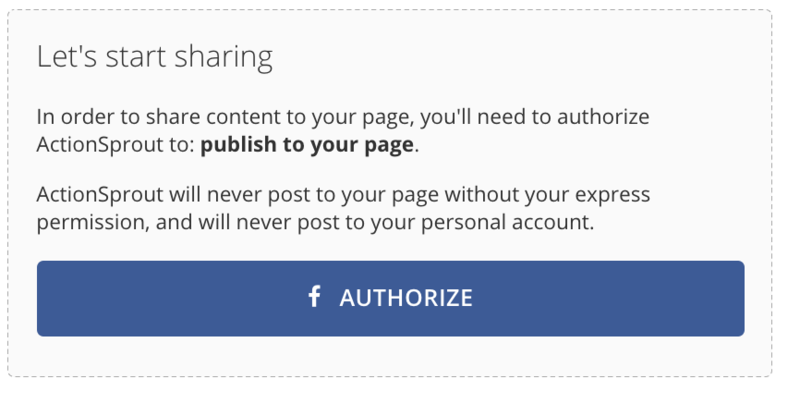 For example, one such permission is referred to as “Manage my Pages.” The ActionSprout app is not managing your page for you or posting on your behalf. 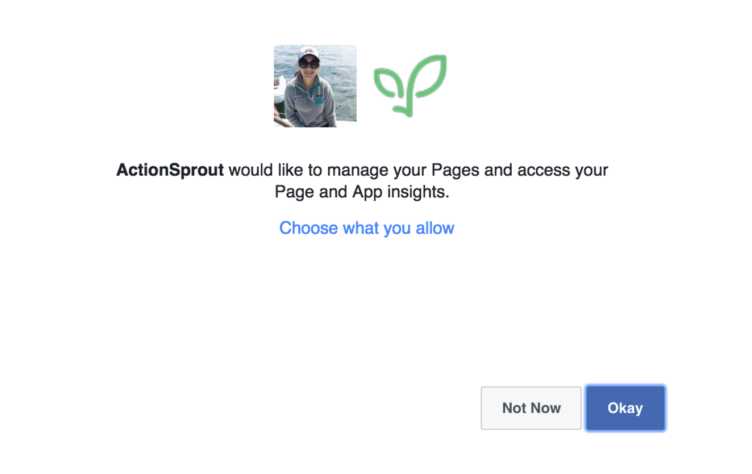 Instead this permission gives you the right to manage your own page with the ActionSprout tool. We know. It's misleading. But as we said, we can't control the naming of Facebook's permissions. We can, however, explain them... thus the reason for this article! Let’s go through a couple of the scarier sounding permissions in more detail. Keep in mind, you'll see some of these as soon as you sign up, while others won’t surface until later, as you start using the ActionSprout app. You'll see this one right when you try to sign up with ActionSprout. You are not creating an account for you personal profile in this step, nor will the ActionSprout app be publicly visible on your personal profile in any way. In fact, creating an ActionSprout account for anything but a Facebook Page is impossible... even by mistake! Authorizing ActionSprout simply confirms who you are and what Pages you have the authority to manage. The app will ask you for two additional permissions. Both sound more intimidating than they actually are. Permission to access information and insights about the page that you manage. This is the "Manage my Pages" permission we discussed briefly above. It's really asking you whether you want to give yourself permission to use ActionSprout to manage part of your Facebook page. 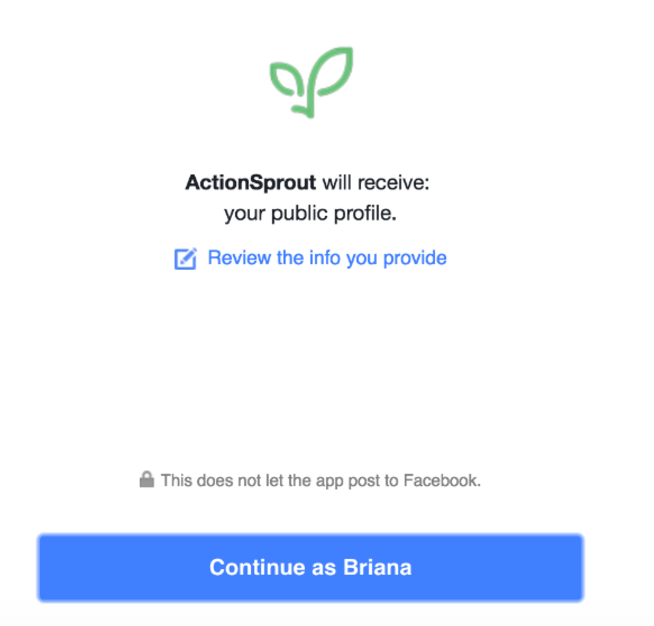 You're confirming that you want to connect the ActionSprout app so you can use it in conjunction with your Facebook page(s). Similar to the permissions above, this is really Facebook asking you if you'd like to schedule and publish posts using ActionSprout. We never post to your Page without your explicit permission. ActionSprout does not use any of your personal information or Facebook permissions. Nor are they shared with anyone else. They are just for you and your team to take full advantage of all the tools and features that ActionSprout makes available to you. Without these permissions, the app simply won't work. You can learn more about how to manage your permissions through ActionSprout at any time. Note that revoking any permissions will mean parts of your app will stop working. Have questions? Reach us at info@actionsprout.com. We're always happy to help!